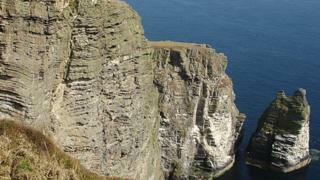 Image caption The Chasms are located in the southwest of the Island near the village of Cregneash. A man has died after falling from cliffs in the Isle of Man. The 51-year-old suffered fatal injuries when he fell in the area of the Chasms in Port St Mary in the south of the island on Saturday. Police said they are carrying out inquiries with family members and will not be releasing any further details at this time. His body was found after a joint search involving the Isle of Man's Police, Coastguard and RNLI.